In games 48, 49, and 50 of the regular season, the Sharks began to answer the biggest ‘what if' in franchise history. 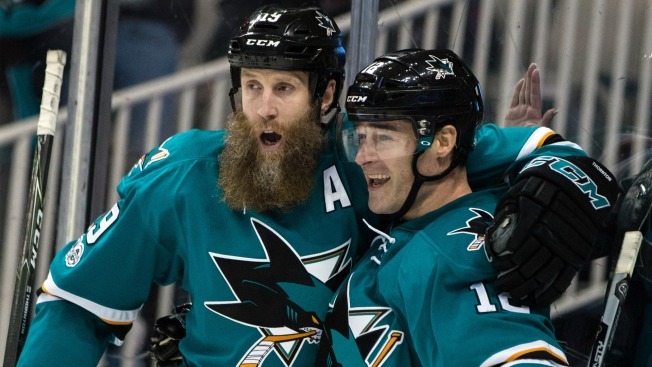 What if they had neither Patrick Marleau nor Joe Thornton in the lineup? Wednesday's 2-1 shootout loss to the Detroit Red Wings was just the third time since Jan. 21, 2004 that San Jose played a game without Thornton and Marleau. Marleau, of course, famously left for greener pastures with the Toronto Maple Leafs this summer, while his fellow ex-Sharks captain reportedly almost joined him. That's according to The Athletic's Kevin Kurz, who wrote in January that Thornton "was closer to signing with Toronto last summer than many people realize." Due to Thornton's right MCL injury, the Sharks have gotten a small glimpse, over the last three games, of what that would have looked like. It hasn't been all bad. On one hand, San Jose has won the five-on-five possession battle, controlling 52.07 percent of the shot attempts and 52.21 percent of the unblocked shot attempts, according to Natural Stat Trick. They've also only scored 0.06 fewer goals per 60 minutes of five-on-five play (2.05) compared to when Thornton was playing (2.11). That's still not all that productive, but not nearly a big enough drop to sound any alarms. On the other, the Sharks are just 0-2-1 in those three games. They've been outscored 12-8 in regulation and overtime, and their once-smoldering power play has only converted on one of its last eight opportunities without Thornton. Plus, their defensive play, which was already a major concern, has remained largely subpar. San Jose has still allowed far too many high-danger chances (12.32 per 60 minutes of five-on-five play) over the last three games. Three games sans Thornton are not nearly enough to draw any meaningful conclusions, but some are beginning to become apparent. San Jose wasn't scoring all that much with him, and aren't scoring much without him, particularly on the power play. There's undoubtedly a hole atop the roster, perhaps two with Marleau also gone. As long as the Sharks' poor defensive play continues to overshadow Thornton's injury, though, answering ‘what if' will have to wait.